In the New York Times this past Sunday the SundayStyles section Bill Cunningham’s On the Street featured the high-low dress. See the video here. This inspired today’s post. I like these high low dresses, Bill Cunningham does a good job describing what they look like. 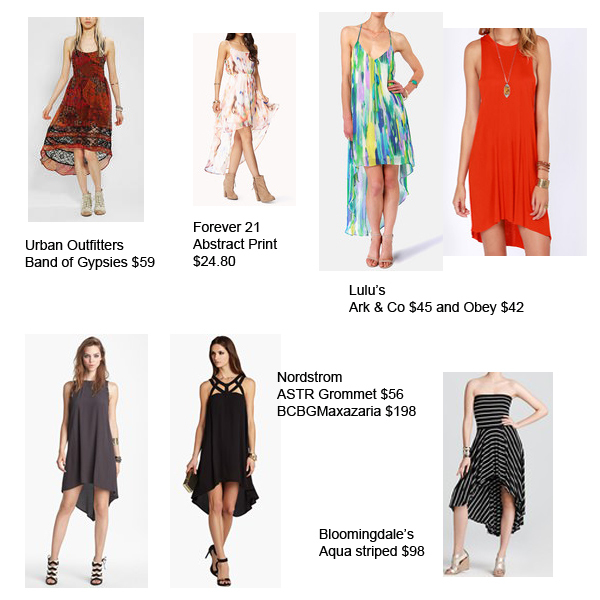 These dresses are available at many different stores, I shopped at LuLu’s, Nordstrom, Urban Outfitters, Bloomingdales and Forever 21. You can style these dresses to go from day to night. Change up the shoes and the jewelry to dress up or dress down. That one was my favorite as well! I like the subtle “high low” trend. The ASTR and the Obey are my favs!